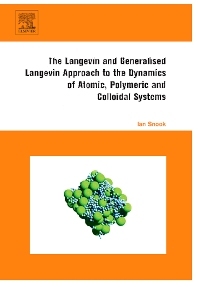 The Langevin and Generalised Langevin Approach To The Dynamics Of Atomic, Polymeric And Colloidal Systems is concerned with the description of aspects of the theory and use of so-called random processes to describe the properties of atomic, polymeric and colloidal systems in terms of the dynamics of the particles in the system. It provides derivations of the basic equations, the development of numerical schemes to solve them on computers and gives illustrations of application to typical systems. Extensive appendices are given to enable the reader to carry out computations to illustrate many of the points made in the main body of the book. Chapter 1. Background, Mechanics and Statistical Mechanics. Chapter 2. The Equation of Motion for a Typical Particle at Equilibrium – The Mori-Zwanzig Approach. Chapter 3. Approximate Methods to Calculate Correlation Functions and Mori-Zwanzig Memory Functions. Chapter 4. The Generalised Langevin Equation in Non-Equilibrium. Chapter 5. The Langevin Equation and The Brownian Limit. Chapter 6. Langevin and Generalised Langevin Dynamics. Chapter 9. Theories Based on Distribution. Functions, Master Equations and Stochastic Equations.